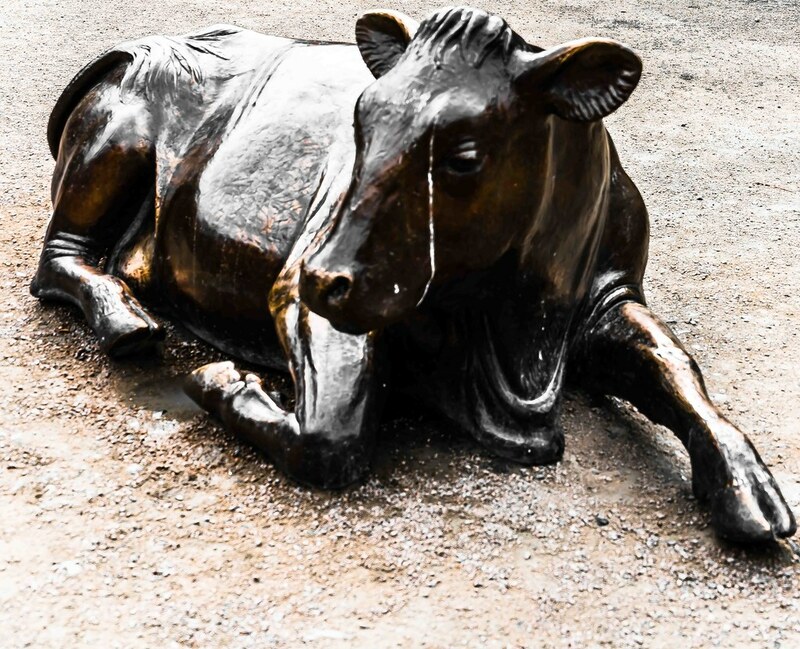 It has taken me many years to get the story behind this very popular [with children] bronze cow in Wolfe Tone Park. Wolfe Tone Park was the cemetery attached to St. Mary’s Church where Wolfe Tone was baptised. Previously it was the site of the 12th-century Cistercian Abbey of St. Mary. After being closed for burials in the 1940s the graveyard was sold to the Corporation in the mid 1960s and a park was constructed. The current park followed from a design competition in 1998. 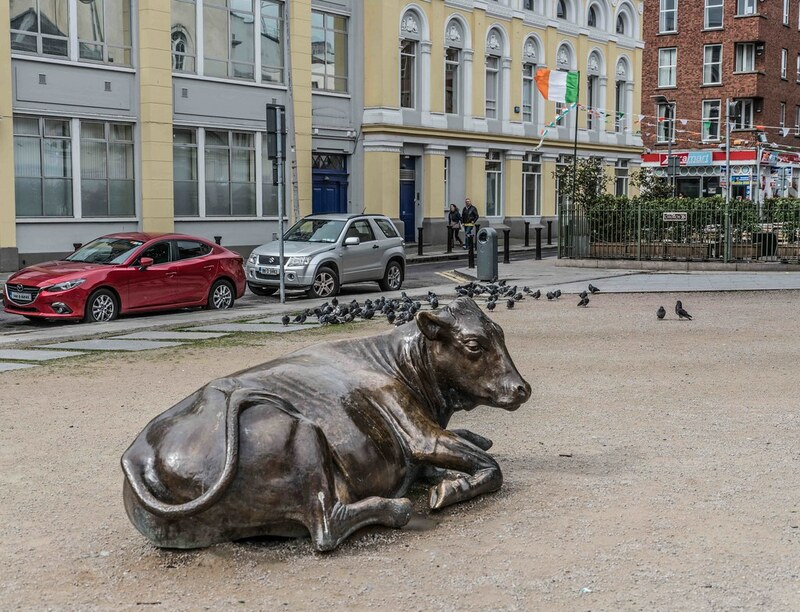 Historically, the presence of cows in Dublin was not unusual. Cattle drivers were a familiar sight as they made their way to the docks, and cattle fairs were held regularly near Smithfield. 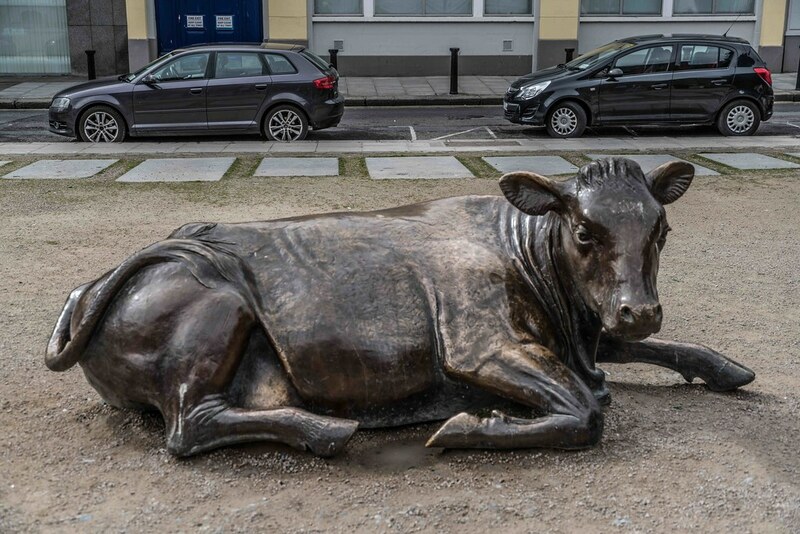 The artist was also mindful that universally the cow holds significance and is symbolic in many cultures and that in Ireland not so long ago the value of ownership of cattle was akin to other developing cultures. The sculpture was modelled in clay in a shop front window of the Leitrim Sculpture Centre so that passers-by could follow the process and progress of the artwork. Mondays were open access days when farmers coming from the local mart could call in and give their expert opinion on what a good cow should look like. Some enthusiasts gave thorough examinations, the shapes of the nostrils were examined and the size of the hooves checked. Thirty-two rubber and fibreglass moulds were taken from the finished clay model and brought to CAST foundry in Dublin. The moulds were painted with 4mm thick wax and assembled for casting using the lost wax method. Cast sections were then welded together, finished and patinated. From creation to completion this work remained focused on its purpose as a public work of art and the encouragement of public engagement throughout. Jackie McKenna is known throughout Ireland for her many public sculpture commissions. For many years, until around 2005, McKenna focused on commissioned sculptures. She has done a number of sculptures in public view and enjoys the conversations and criticisms that occur as a result. She is a co-founder of the Leitrim Sculpture Centre in Manorhamilton.